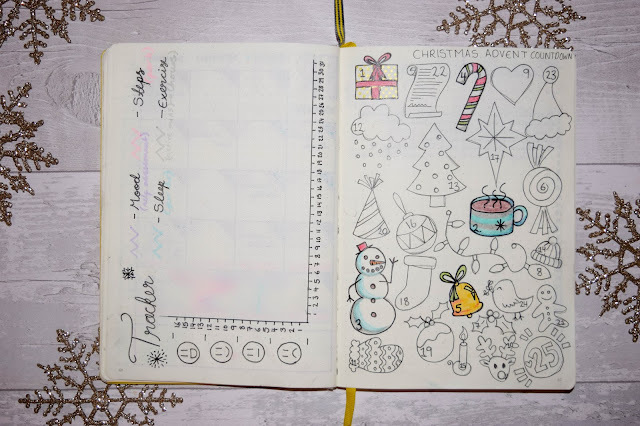 Another month, another bullet journal theme! 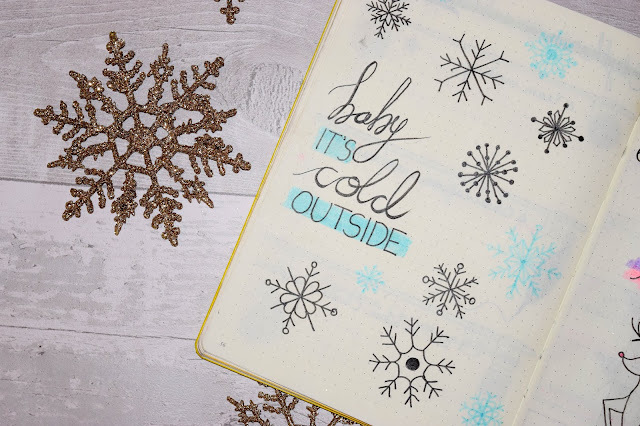 This month, in the spirit of cold weather and Christmas I decided my theme would be 'Winter Wonderland'. 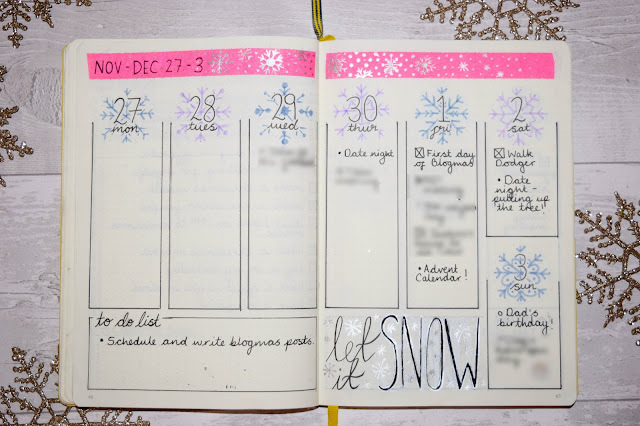 I loved the idea of a really pale but bright bullet journal look with snowflakes everywhere, so that is what I did. 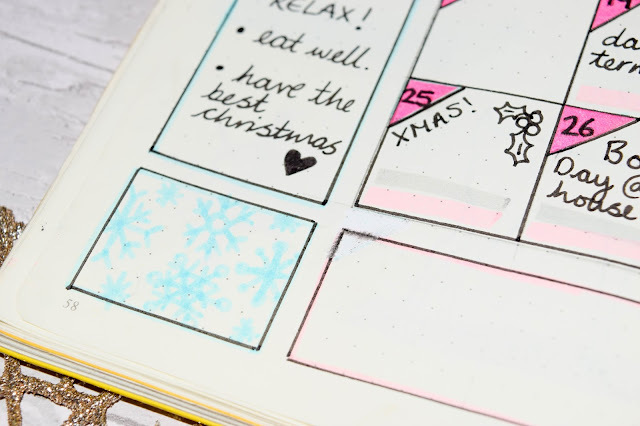 I did go a little overboard with this month since there were so many Christmas themed pages that I wanted to do, so there's a lot to go through... I hope you enjoy them anyway! 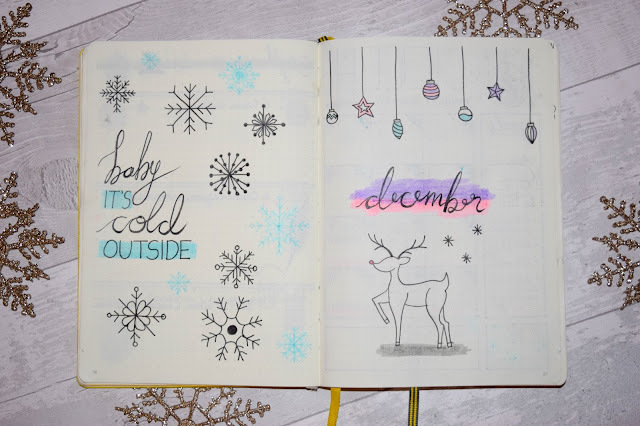 So for December I chose to have my favourite Christmas song lyrics on my quote page and then a simple reindeer under December. The pages didn't turn out 100% like I would have liked them to but I didn't really have a design I was following. I kind of went with what I felt like which I feel gives this more of a personal touch this month. 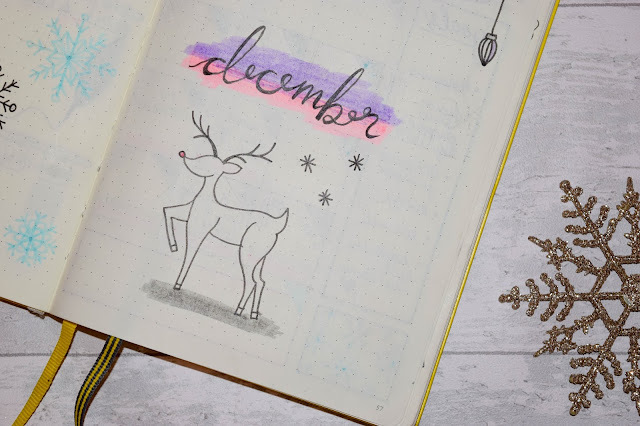 I really enjoyed drawing my reindeer and I do like how I've written December. Maybe next time I'll choose one colour to go under the word. The next pages as always are my month overview and I reverted back to a simpler look with these pages - so much so that I still don't have anything in the boxes below. Again, I went with what popped into mind first and so the snowy-tree-in-bauble design in the corner gave the page a Christmassy touch and stopped it being a bit too boring. I made a huge amount of mistakes on this page which took me forever to correct. I accidentally got the dates a little wrong so they went a bit funny. Just a tip, don't write with fine liner over tip-ex; It doesn't work. 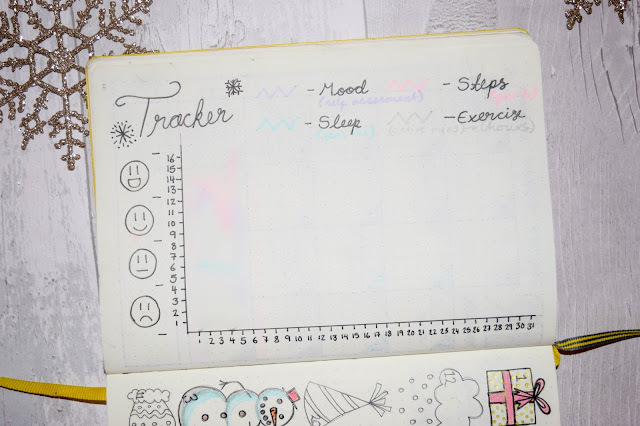 This month I decided to put all my trackers into one after being inspired by my trusty Pinterest board where I have pinned hundreds of bullet journal page ideas, designs and all sorts. I decided to put my steps, exercise, mood and sleep tracker all in one and it's working really well. It looks good and it is more fun to fill in now. 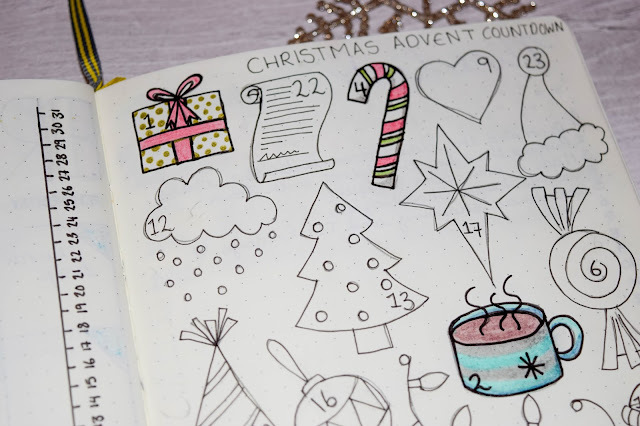 I also decided in the spirit of Christmas to add a advent colouring countdown to my bullet journal which I think was my own idea. 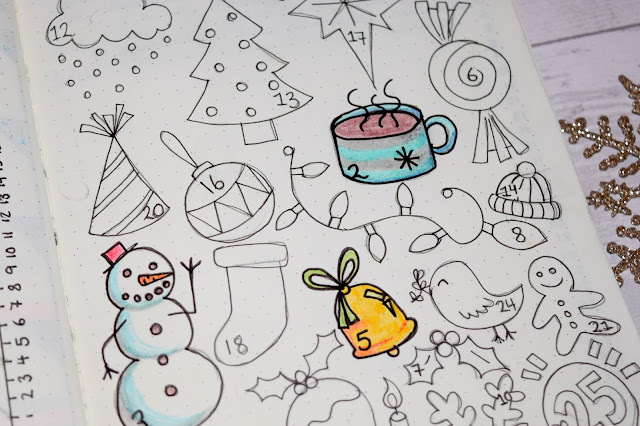 I liked the idea of colouring something Christmassy everyday. 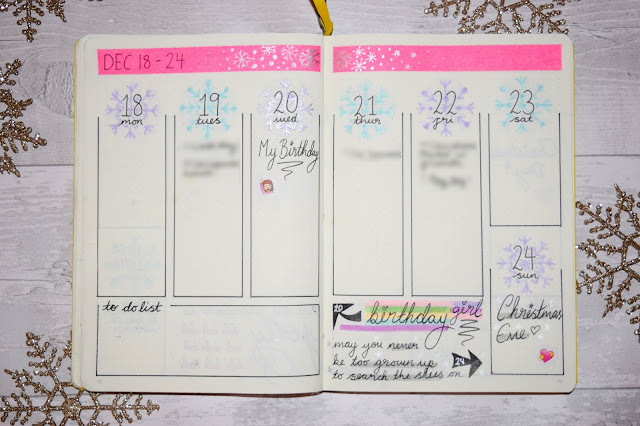 Some other pages I added this month just because was my naughty and nice list which I found on someone else's blog via Pinterest which I absolutely loved. 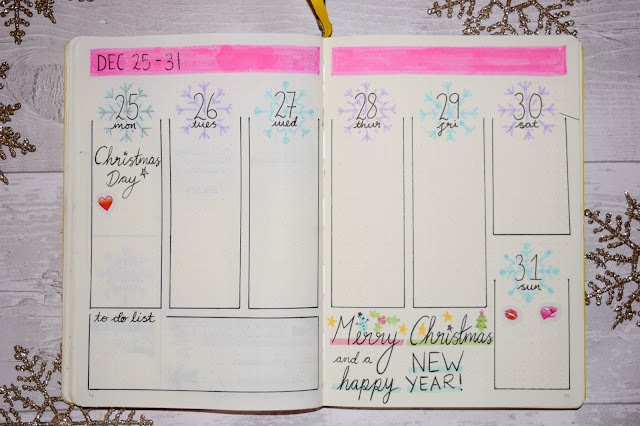 I thought it was so cute and actually have been using everyday this December so far. 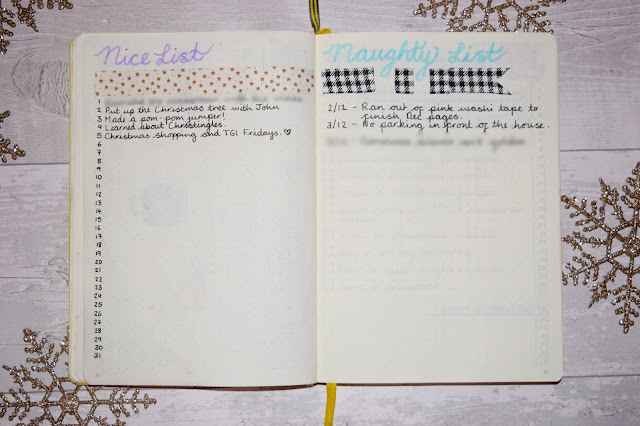 The nice list is for nice things throughout the month (at least one everyday) and the naughty list is for those annoying things that might happen every now and then during the month. I thought this was a fun idea and probably shows how much nice outweighs naughty! 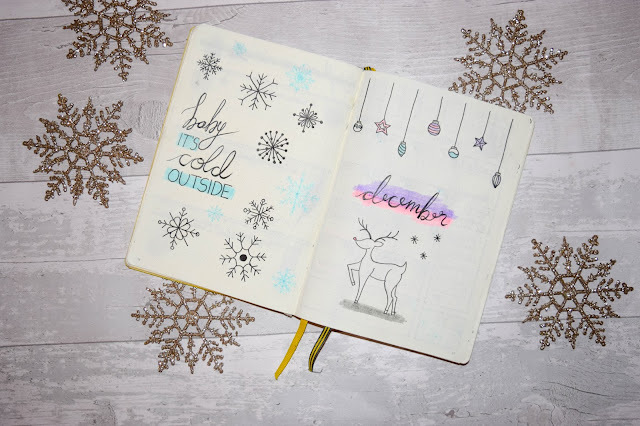 I love my December overviews and simply because I designed it all myself and I think it looks brilliant. Of course there are things I would do differently next time, like check if I have enough washi tape, but I like it nevertheless. 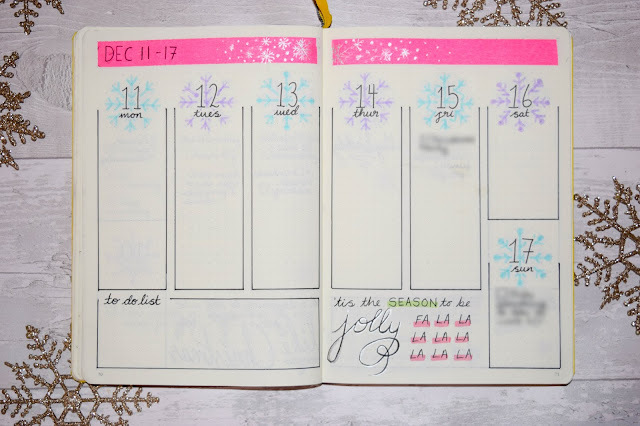 I said in October that I didn't like the long vertical weekly spread but I'm trying to work with it and love the way it looks for December - especially with the snowflake design. 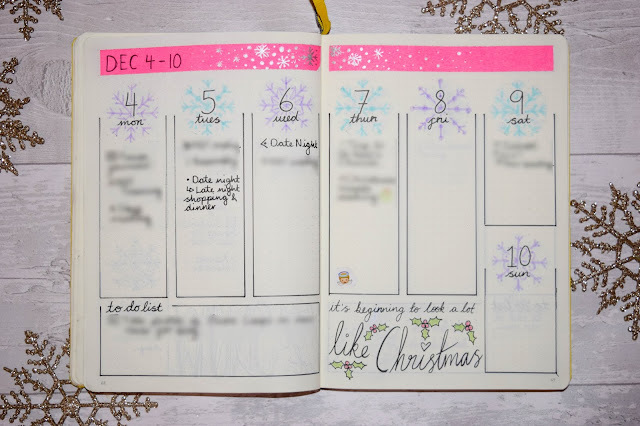 I'm looking for something that uses the page's space well and that isn't your typical horizontal spread. The vertical is working well for me this month but I like writing all on one line so it does still bother me slightly. Anyway, it's a love hate thing, but it looks good so.... Yeah. LOL! Another satisfying thing is that I get to start the new month with the first falling straight on a Monday. It's oddly satisfying and I can't wait to think up what January is going to look like. 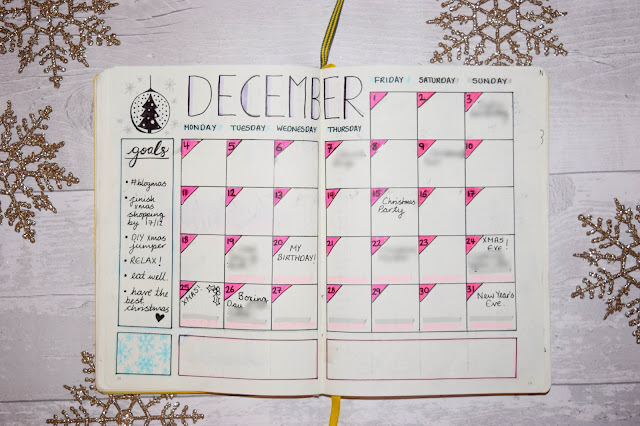 What do you think of this month's bullet journal set up? 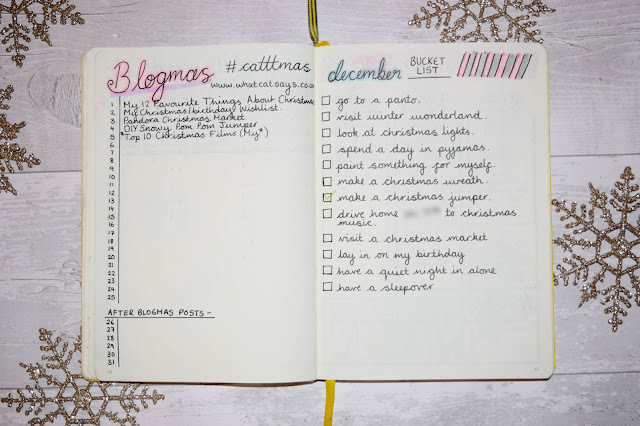 And do you bullet journal? I'd love to see what yours look like! 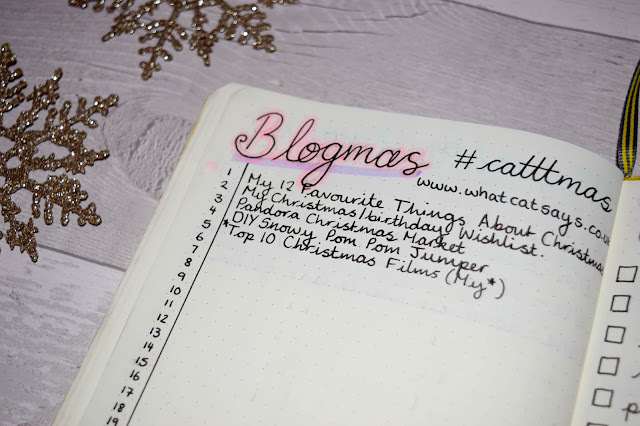 Also, a week of Blogmas done! Woohoo! Officially posted more than I did for the whole of November. Oops. But I'm really enjoying writing and having it all themed around Christmas (and my birthday.) I'm on a roll with this - let's keep it going! So much inspo here! 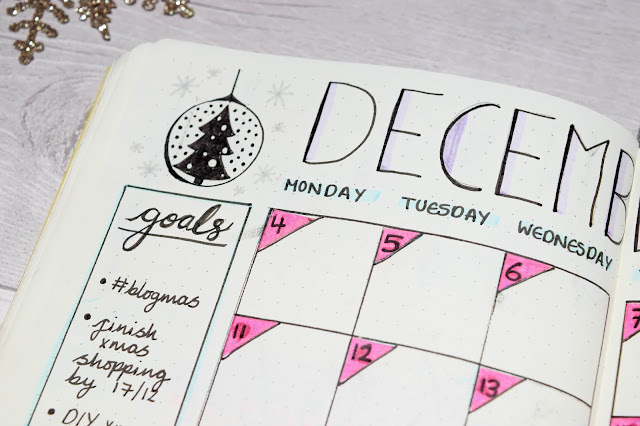 Definitely thinking about starting a bullet journal in the new year, the look so wonderful!